Many exit nodes are not anonym. 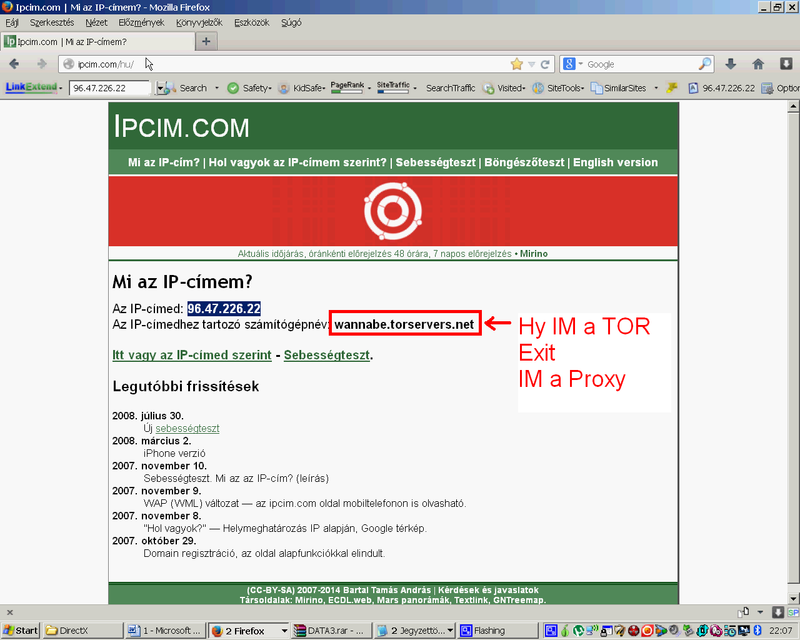 It says "Hi I'm a Proxy Or Hi I'm a Tor Exit Node on host name". Here is a test site: http://ipcim.com/hu/. So websites can detect you use Tor, and this is the first problem. The second problem some entry nodes says (the first proxy you connect directly the 3 hop) says too I'm a Tor exit.So your Internet service provider can detect you use Tor. 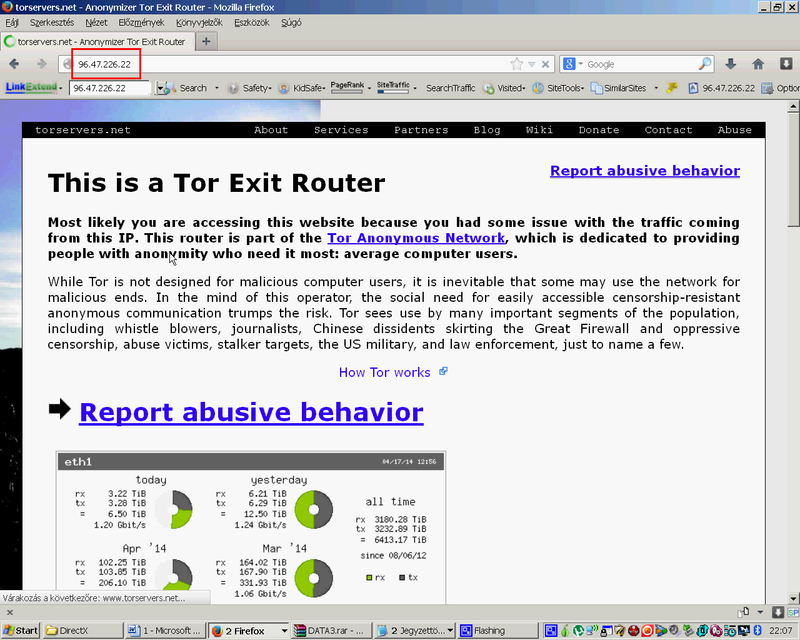 When you type this tor exits IP address the Tor browser this show you a site what tell you this is a tor exit node. I have a idea how fix this problem. The big problem on Tor network was the „Run as Client only function”. This 'Run as Client only function' I would not be supported. Who uses the Tor network be required run Exit, non-exit or bridge relay. And I have to replace Vidalia/sharing “Run as Client only” function to automatically select Exit, non-exit or bridge relay function. I'm telling everyone who use the Tor network required to participate in the operation also. The result more exit nodes more anonymity and more users more secure hops. I do not agree that some users can only get and give nothing. It's just like stealing. Be required in the future all Tor users run select Exit, non-exit or bridge relay. Those who do not like this look for another service. Much more Exit Nodes need what run normal users who use tor client. Normal users who run Exit Nodes won't show hey i'm a proxy. And Those who do not like it do not use. I know it's not your fault, this failure of Special users who run Exit Relays and advertises in host name and IP address im a Proxy service or im a tor exit node. So more Exit Nodes needed what running the normal users so you can connect normal users.Normal users show you normal Internet providers and normal host names. 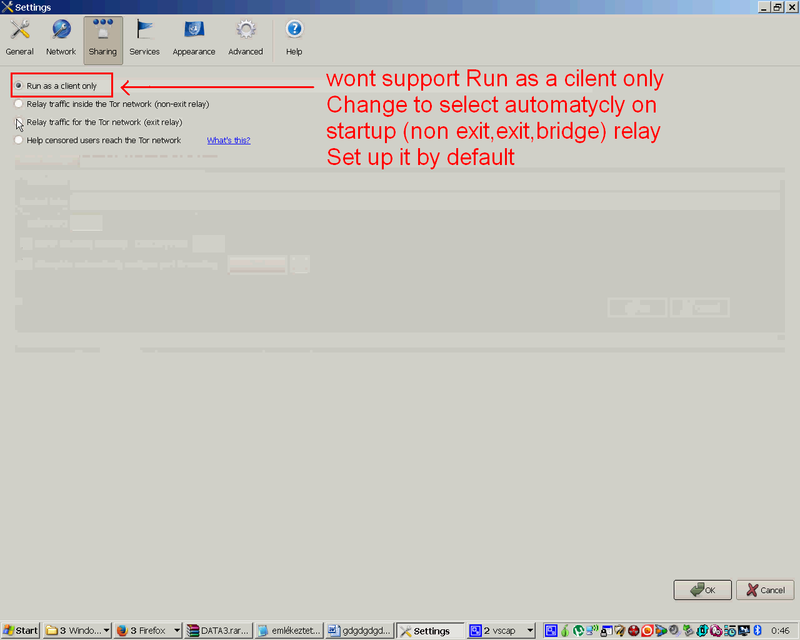 just an idea Change "Run as Client" funktion to select auto on startup by default (Non exit,Exit,or bridge) relay.And wont support use as only Client. Exit Nodes what run normal users much anonim and shorter time running nodes less chance that the current country's secret service interception. When running an exit node, it is highly recommended to make it as clear as possible that it is an exit node. This helps the operator deal with DMCA notifications and abuse reports and the like. Further more, it is impossible for any relay, exit or non-exit, to hide the fact that they are a relay. The list of all relays and their flags is publicly available. This is even necessary for the network to function, as clients need to pick relays for their circuits. Your ISP can tell that you use Tor (unless maybe when you use obfuscated bridges), and your ISP definitely knows when you run a relay. They even know who your entry guard node is. But they don't know where you exit from and to, and they can't decrypt your traffic. If you need the anonymity of Tor to protect you from censorship, there is a good chance that you are not in the position to run a relay. Edit to add: Tips for Running an Exit Node with Minimal Harassment <-- this details all the recommendations for running a Tor exit node. tor is not personal property to push users anything, your idea of stealing is capitalist idea, not all of us grew up in the same system. "to contribute in order to get something" is mentality that is good for riches as they accumulate (or steal legally after they gave money to ruling pol.parties) the biggest part of capital produced by society. if we follow capitalist logic, tor will not be for free than commercial product. and developers could ask you for much more money than you gave to tor when you became relay (you pay maybe some traffic to your ISP). In the Future i think what we need was nut just users can select by (exit,non exit,bridge)relay but we need users can select automatically this function on TOR startap. When TOR startap The user select what hi want to help the network (exit,non exit,bridge)relay or the program Automatically select (exit,non exit,bridge)relay funktion on startup.The “Run as client only” method I would not let anyone.It just hurts the TOR network.The TOR network it would be much safer,anonymously,and not traced back. The too long time running nodes vulnerability is government interception. There is a need more Exit and non exit nodes by average users who only simple users.Not companies, universities, only simple users. I think it is essential in the future the safe TOR network operation. I tested some exit nodes by country and too much the what I think that does not simple users are operated this exitnodes. This is a vulnerable point in TOR Network today. Therefore, I think all users in the future duty to participate The Tor Netvork operation some form without exception. It involves not only we want to get if therefore it is our duty to give everyone interest. Not the answer you're looking for? Browse other questions tagged anonymity relays security exit-relays guard-node or ask your own question. Are there tor exit nodes (country specific) that are not listed in the tor node list?